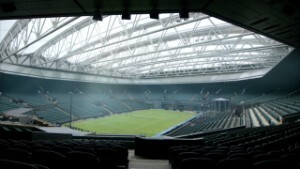 Defending Wimbledon champion Andy Murray took on Bulgaria's Grigor Dimitrov in the quarterfinals Wednesday. 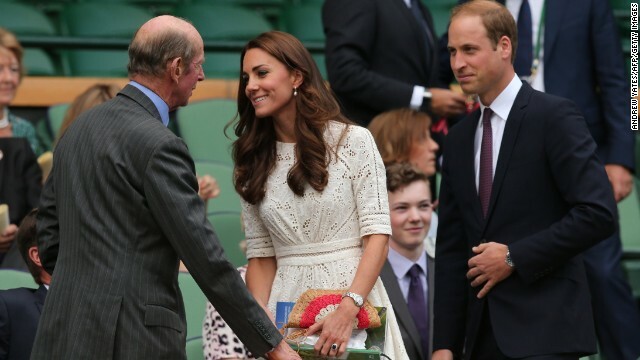 The Duchess of Cambridge, and her husband Prince William, the Duke of Cambridge, were in attendance in the Royal Box . Dimitrov, ranked 13 in the world, made a fast start and took the opening set 6-1. The home crowd was silenced further when Dimitrov took the second set 7-6 to lead 2-0. Dimitrov held his nerve to win the final set 6-2 and reach the first grand slam semifinal of his career. 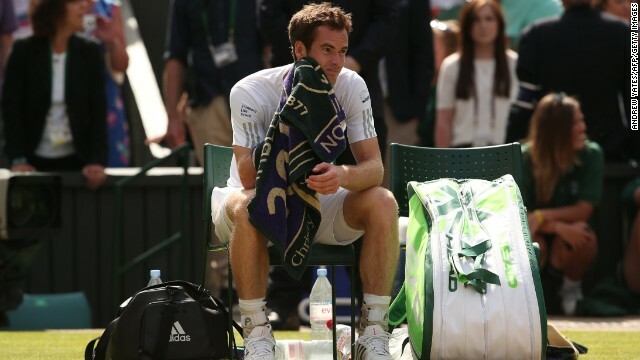 Murray is left to reflect on a disappointing afternoon after being outplayed by Dimitrov. (CNN) -- This was not how it was supposed to end. The past week had been a procession -- the next few days were supposed to end in a coronation. With the future King of England in the Royal Box, the man who wore the Wimbledon crown so proudly allowed it to slip on Centre Court. Andy Murray, the first British man to win the tournament in 77 years, was not just thrown out of his court, he was brushed aside by a man threatening mutiny at the top of the men's game. Grigor Dimitrov has hinted at performances like this before -- but this was the announcement his potential had always promised to deliver. The Bulgarian, 23, for so long hailed as the heir apparent to 17-time grand slam winner Roger Federer, is ready to finally erase the tag which has haunted him since he first came to prominence -- that of "Baby Fed". 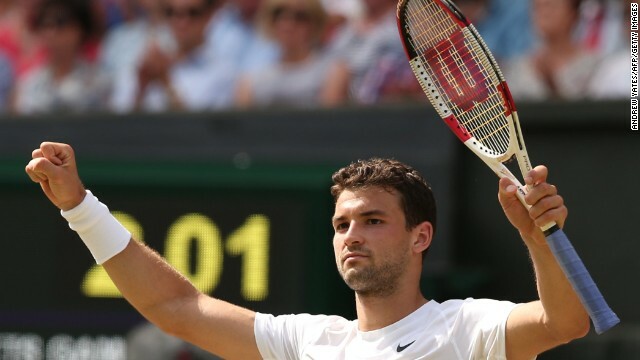 Ranked 13 in the world, Dimitrov gave a performance which left nobody in doubt that he is a serious challenger for the title following a 6-1 7-6 6-2 win over the defending champion. Never before has Dimitrov gone further than the second round at the All England Club -- now he is just one victory away from a grand slam final. But the signs had been there. Dimitrov, who won the Queens Club title - a warm-up tournament before Wimbledon - has been improving with each and every match. He will now play his first ever grand slam semifinal against Novak Djokovic -- the 2011 champion and the tournament's top seed. Djokovic, a six-time grand slam champion was given a real scare by Croatia's Marin Cilic before eventually prevailing in five sets -- 6-1 3-6 6-7 6-3 6-2. Also safely into the final four is the man who many have likened Dimitrov to -- Roger Federer. The veteran of the All England Club booked a ninth semifinal appearance after beating fellow Swiss Stanislas Wawrinka 3-6 7-6 6-4 6-4. The Australian Open champion was seen by the doctor during the match and faded after a strong start as Federer's supreme ground strokes began to find their range. Federer, a seven-time Wimbledon champion, said he was pleased to be in the mix after a disappointing 2013 tournament when he was beaten in the second round by Ukrainian Sergiy Stakhovsky. "I'm just really pleased I'm back strong here at Wimbledon," he told reporters. "Last year I didn't even come close so I was very deflated." He will face Milos Raonic in the other semifinal, after the No. 8 seed from Canada disposed of Rafa Nadal's conqueror, Nick Kyrgios, 6-7 6-2 6-4 7-6. Djokovic's game will be firmly tested against Dimitrov -- a man playing with confidence, style and a whole lot of swagger. Born in Haskovo, Bulgaria, Dimitrov trained at the same tennis academy in Spain as Murray, albeit not at the same time. The two are known to be friends off the court -- not that there was any sentimentality on show as Dimitrov wielded his racquet like a magician holds his wand. He began at a rapid pace and never allowed Murray to find a foothold from which he could launch a fightback. "I'm very disappointed with the way I started. I felt that gave him confidence at the beginning. 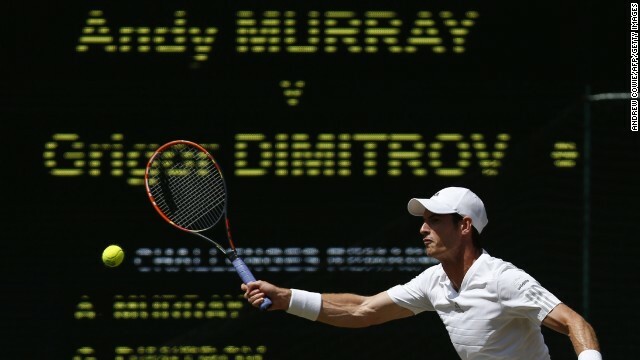 It's a lot easier to settle down when you're two sets up," Murray, the world No. 5, told the BBC. "It wasn't a great day. I felt fine in the warm-up but got off to a bad start, which was the disappointing part. "It wasn't good enough. There is time to come back, but I didn't take my opportunity in the second set. "He played a very solid match, making few mistakes and a lot of returns. All the percentages were in his favor. I just wish I'd made it tougher for him." A year ago, it was all so different. Murray, the man who had cried his way into the nation's hearts after his 2012 final defeat by Federer, dispatched Novak Djokovic in straight sets on to become the first British man to the win the singles title since Fred Perry in 1936. If the first week of his defense was anything to go by, the expectation was that Murray would reach the semifinal stage at the very least. He had cruised through his opening four rounds without dropping a set -- a complete contrast to his opponent Dimitrov, who had been forced to scrape and fight through a five-set contest in the third round with Ukraine's Alexander Dolgopolov. 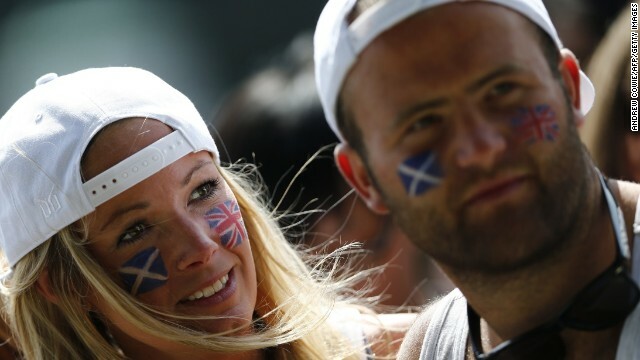 As those with British flags painted on their faces and draped in the Union Jack took their places on Centre Court, a Murray defeat was perhaps the last thing on their minds -- somewhere between a shortage of strawberries and a drought of Pimms. But after sharing the two opening games, their hero failed -- spectacularly. Dimitrov won five games in a row to take the first set in 25 minutes and leave those fervent fans in a state of shock. Those who have followed Murray at Wimbledon over the past few years are used to the rollercoaster nature of his campaigns. But that famous fighting spirit, that belligerence which makes his such a competitor, appeared to have deserted him. Even in the second set where he immediately broke back to level at 4-4 after losing his serve, the belief that Murray would then go on and level the match never materialized. Instead, it was Dimitrov who held his nerve in the tiebreak, winning it 7-4 to take a stranglehold on the tie -- one which he never looked like relinquishing. And so it proved. Showing little or no sign of being nervous or overawed by the occasion, Dimitrov broke not just Murray's serve -- he broke his spirit. There was an inevitability about the result and Dimitrov could celebrate when Murray placed his final shot into the net. "I'm excited. It's never easy coming to play against Andy, especially with the home crowd," Dimitrov told the BBC. "As soon as we were warming up, I said his game wasn't at the highest level, while at the same time I felt confident. The second-set tie-break was a key moment for me. "This was one of those days where I was pretty steady throughout the whole match. It's a tough feeling when you know someone outside the court but then you come to play them in the match." 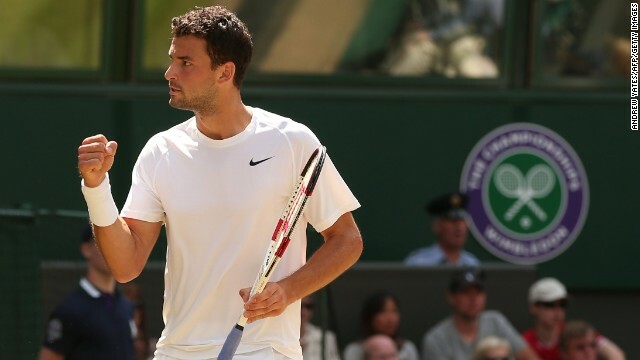 Dimitrov will now go onto face either last year's finalist Djokovic or Croatia's Marin Cilic in the next round. For those who celebrated Murray's victory last year -- well, they'll just be hoping they won't have to wait another 77 years for their next Wimbledon party.